Nancy: Short Fiction Round-Up, and a Story! If you really love short fiction challenges, either writing or reading them, you might want to check out Chuck Wendig‘s Friday blog posts for his flash fiction Friday prompts. You can also pop by Writer Unboxed, where they run monthly short fiction (really short, like 250 words short!) contests. The WU December contest is their Grand Finale, and is limited to the previous winners of the monthly contests. Nick Olesen sat on the cold steps outside his apartment building in the Vesterbro neighborhood of Copenhagen, twirling an unlit cigarette between his fingers. 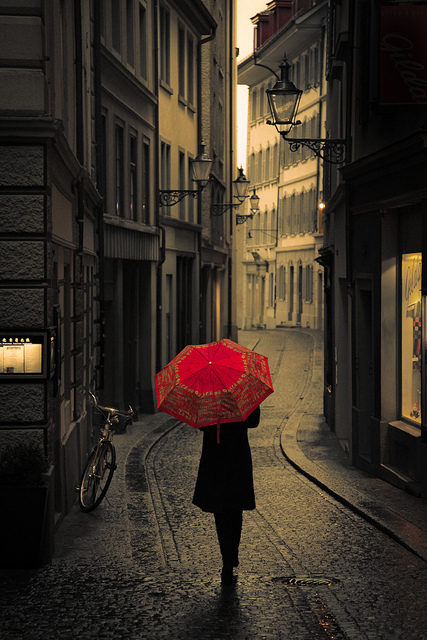 He peered down the street through the gloomy glow of streetlights, picturing the girl…Lena something…walking away. She’d been dressed head to toe in black, but he’d been able to watch her for blocks, focusing on the red dot that was her oversized umbrella fading to a pinpoint as she left him. Why couldn’t he remember her last name? He scrubbed his hand over his face, knowing damn well why. He hadn’t bother to ask for it. A dark car pulled to a stop on the street in front of him and two middle-aged men in overcoats climbed out of it. One swished his black trench coat to the side, showing the badge on his belt. It wasn’t necessary – everything about them telegraphed ‘cops’ – but Nick nodded his understanding. “Mr. Olesen? I believe we spoke on the phone?” The badge flasher spoke to him in heavily accented English. Nick didn’t bother to tell them he could speak Danish, had been fluent in it since childhood. To these men, he was just another udedansker, not even an ex-pat, but the son of an ex-pat, with nothing to contribute to Danish society but his abundance of American dollars. Badge flasher held up his hand to silence Nick. His partner, driving the car, just shook his head and muttered. The roads were nearly deserted – on a Thursday night, the Copenhagen streets away from the bars and clubs cleared out early – and they made it to the station in minutes. By the time his new friends had dragged him out of the car and into the imposing, gothic structure that housed police headquarters, Nick had a plan. “Can I make a call?” He stuck to English. Maybe they’d slip up and say something, anything in Danish that would give him a clue about what the hell was going on. The arresting officers handed him over to a uniformed man who looked like he was probably younger than Nick, possibly no older than early twenties. The man hustled Nick into a bullpen full of men and women, some in uniforms, some in business casual outfits. Down to a person, they turned to look at him. For the first time since he’d learned about the misunderstanding, had heard the police wanted to question him about a murder that had happened last night, real fear crept up his spine and tightened around his throat. As the man stepped away from the desk to speak in a low tone to a woman in a crisp, black pant-suit, Nick dialed the only Danish phone number he knew by heart. Pernilla picked up her cell phone on the first ring. “This is Detective Nielsen,” she said in Danish. “Pernilla, it’s Nick. Nicholai.” He continued speaking in English in case any of the nearby cops were eavesdropping. “Thank god!” Nick’s breath came out as a loud sigh of relief. He was right. This was all a mistake and Pernilla could fix it. He closed his eyes for a minute. It was a testament to the knife’s edge on which his life balanced that he had to tell his lover that his alibi was the one-night stand he’d picked up after Pernilla had canceled their date to spend the night with her husband. “What?” He turned to see Pernilla walking toward him, cell phone in one hand, a large, clear plastic bag in the other, her face pale as her white-blonde hair, her blue eyes shining. This entry was posted in Character, Creativity, short fiction, short story, Uncategorized and tagged Chuck Wendig, Copenhagen Blues, flash fiction, Friday Writing Sprints, Nancy Hunter, Nicky O mystery series, Writer Unboxed blog. Bookmark the permalink. I don’t know about *soon*, as there are other manuscripts in line ahead of this one, plus I’ll need at least another research trip (or two) to Denmark, but I’ll keep you posted when there is progress! Nice, Nancy, I really enjoyed that. As Penny said, more, please! As Nick’s the protagonist of your to-be-written-someday series, I guess he gets off the hook somehow??? Nick is the protagonist, and he does, indeed, get out of trouble…and then back into it again. He seems to have a knack for it :-). I don’t know if there will be a murder in the final story (it was going to be a different kind of mystery), but there’s definitely a disappearing alibi witness, so it’s possible this scene or something like it will make it into the book. Wow, that was great! I’ve never tried short fiction. Of course, I’m having trouble working on my own story, but that was fantastic! Way to go, Nancy! Thanks, Neen! I’m having trouble of my own with my revisions, so this was a nice (and quick!) little palate cleanser. Now, back to the grind for both of us!